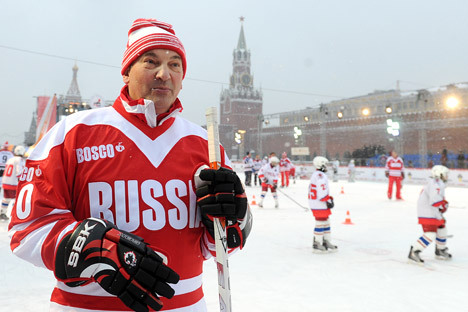 Vladislav Tretiak: "This team can beat Canada"
Legendary goaltender Vladislav Tretiak praises the Russian national team after its victory in the Channel One Cup. Following Russia’s victory in the Channel One Cup, president of the Ice Hockey Federation of Russia, legendary goaltender Vladislav Tretiak, said the Russian national team could beat any opponent. Tretiak talked to Gazeta.ru about some of the team’s players, goals and prospects. Gazeta.ru: Did you enjoy the way team Russia played? Vladislav Tretiak: I don’t think there’s team out there that can beat Russia today. You always have to win at home. You can’t think of a better New Year’s present from the national team. Gazeta.ru: Can this team beat the U.S. and Canada? V.T. : I don’t see why not, if they can keep playing with such smoothness and precision. Moreover, we won with a team that is not the final lineup; it will only get stronger. The team makes mistakes and has some problems – there’s no doubt about that. But we are capable of beating them. What we have seen is the Russian national team coming into its own: we are on the right track. Gazeta.ru: Should Russia try to put together a team that would be just as strong for the next round? V.T. : I don’t think so. They should check out the young players. If they think about inviting the top players, they should do so before the world championships. No spots are guaranteed in the national team. There are strong players in Russia that haven’t played for this team – Alexander Semin, for example. V.T. : And today I’ll single out Konstantin Barulin. The Czechs had their moments, and the Finns attacked a lot. It might have looked easy, but it was a difficult tournament. Barulin really bailed us out. Even if we play our best game, we need to respect our opponents. Gazeta.ru: We took a good look at these goalies. Who would you like to try out during the next stage? V.T. : We have Bryzgalov and Varlamov. Competition is an excellent thing, but it is up to the coach to decide. Gazeta.ru: Will the national team go to the next world championships to win the title or test its reserve players? V.T. : We always play to win. How can we set our guys other goals? Even if we do try some other players out, we are always looking to win. Gazeta.ru: Should the Euro Hockey Tour be expanded? Is a European championship a possibility? V.T. : We had a meeting with the Euro Hockey Tour participants yesterday. We’re thinking about what will happen after 2014, when the contract expires. We should introduce some variety, but I can’t speak about any specific options, because we are still discussing them. We may be in a position to tell you something at the next stage in Sweden. The interview is first published in Russian in Gazeta.ru.